1 in 4 people in the UK experience mental health issues every year and whereas the overall number of people with mental health problems has not changed significantly in recent years; worries about things like money, jobs and benefits can make it harder for people to cope (www.mind.org.uk). These problems have consequently played a role in suicide becoming the leading cause of death for 20-34-year olds in the UK. What’s more, figures around mental health do not include those in hospital, prison, sheltered housing or homeless, suggesting they significantly underestimate the prevalence of mental health issues in the UK. 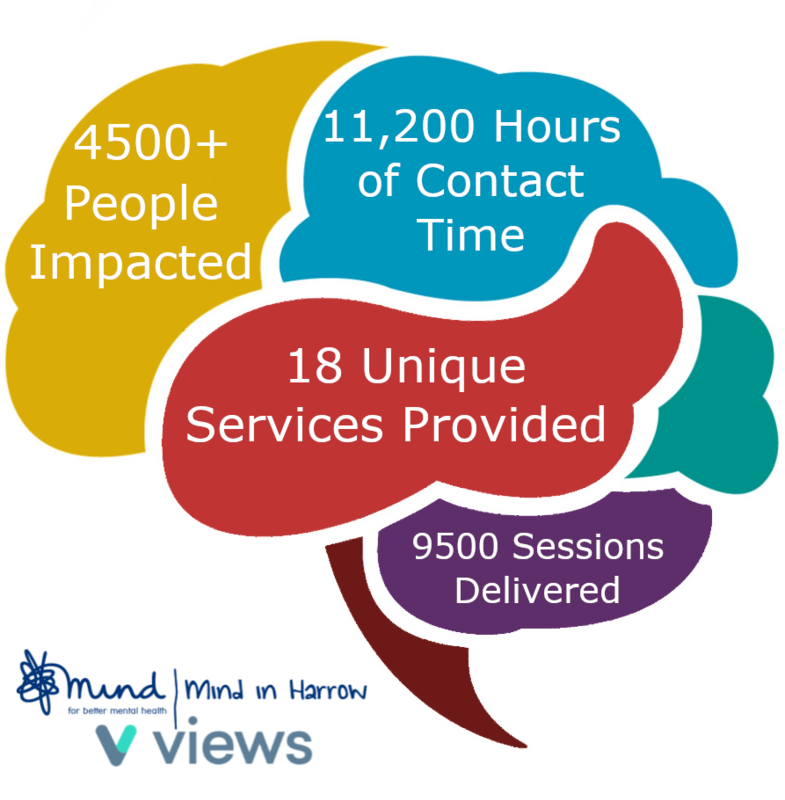 Since implementing Views in 2013, Mind in Harrow has developed into an organisation that not only ‘copes’ with its data but now has the ability to analyse and report on it, enhancing service user and organisational outcomes. At present, Mind in Harrow is running 12 different services through the Views platform. Mark emphasised how the flexibility of Views has enabled the charity to monitor and evaluate diverse services, each with differing reporting requirements. By using Views to monitor and evaluate the Nedaye Zan project, Mind in Harrow was able to publish a 2-year report which secured £100,000 of Comic Relief funding over the next 3 years. Moreover, Views reporting has enabled the charity to secure £60,000 over 2 years to support the Somali Hayaan project and 200,000 over 3 years to support the Head for Work project. Showcasing Impact through Views: The infographic (top left) highlights the great work Mind in Harrow has been conducting through Views since 2013. This is why we created Views. Views gives organisations such as Mind in Harrow the platform to streamline their operations and processes, improve standards and increase efficiency to their services. Ultimately, having a greater impact on the people that need it the most.